Gertrude Jekyll was always interested in gardens, and her reputation was sufficient for her to attract the notice of the upwardly mobile Irish garden writer William Robinson in 1875. They both wished to promote the use of hardy plants over the prevailing taste for seasonal bedding. Miss Jekyll began to write articles on these and related matters for Robinson’s successful magazines. By the early 1880s, she was a senior figure within the RHS, eventually receiving the Veitch Memorial Medal and the Victoria Medal of Honour. A further breakthrough came in 1889, when she met the young architect Edwin Lutyens for the first time. She gave him access to her social circle as clients, and supplied distinctive planting schemes for many of his gardens. A key project was her new house, Munstead Wood, near Godalming, Surrey, designed by Lutyens in the middle of her complex experimental garden and begun in 1894. True to her principles, she ensured the house and garden features were built from the local Bargate stone, with simple sand paths between the borders. The garden consisted of seasonal and colour-themed borders of hardy plants, including herbaceous perennials, shrubs, climbers and hedges, breaking out into Robinsonian informality at the woodland edge. Here, Miss Jekyll developed her ideas on colour-graded planting rooted in Michel-Eugène Chevreul’s chromatic theories of her youth, so that the long border was laid out rather like a colour wheel stretched out flat, with each colour group balanced by dots of the relevant complementary colour and steadied by groups of grey and white. In order to sustain the effects through time, drifts of annuals were dropped in as necessary. These experiments formed the basis of the Jekyll style. 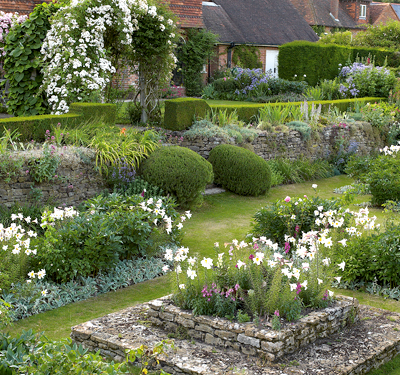 The format is readily recognisable in her many planting schemes, whether at Hestercombe, Upton Grey (pictured), Heywood in Ireland or Le Bois des Moutiers in France. This was partly the result of her notorious reluctance to travel: no consulting of the genius of the place for Miss Jekyll. Thus we expect to find simple geometry, blocks of pink china roses (below), spikes of yucca, cushions of bergenia and Stachys byzantina used as edging, and dribbles of snow-in-summer hanging from ‘dry’ retaining walls. Her durable reputation can be explained by her ability to develop and explain her coherent ideas, and her even-handed skill in promoting the primacy of garden design over the collection of rarities without ever taking up an extreme position. In 1899, Country Life whose founder, Edward Hudson, was a key patron published Wood and Garden, a reworking of some of Miss Jekyll’s articles on the creation of her home garden at Munstead Wood. This was followed in 1900 by Home and Garden in similar vein. Further volumes on Lilies for English Gardens, Roses for English Gardens and Wall and Water Gardens soon followed, forming a sort of compendium of the Jekyll garden philosophy. Her most enduring book was Colour Schemes for the Flower Garden (1908), complete with detailed foldout plans of borders at Munstead Wood. All these books were profusely illustrated with her own photographs. In 1912, she co-wrote Gardens for Small Country Houses with Country Life’s architectural writer Lawrence Weaver. 1840s Gertrude Jekyll was a difficult child. Her father called her a ‘queer fish’; she infuriated her mother by clumping through the best rooms of their Surrey country house in her gardening boots. 1860s As a young woman, she attended the South Kensington School of Art, where, as a disciple of John Ruskin and William Morris, she imagined herself embarking on a career as a painter and artist-craftswoman. On the title page of her first book, she described herself as a ‘working amateur’. As a painter, she was unsuccessful, but enjoyed a certain Society fame for her decorative work in inlay, silverwork and interior fabrics. And thus she might have remained, a talented but obscure figure on the fringes of the rising Arts-and-Crafts movement from the mid 19th century. 1880s Of all those who have attempted to design gardens according to artistic principles, Miss Jekyll was perhaps the most conscientious. She observed the way Michel-Eugène Chevreul’s mid-19th-century theories of colour combination had been applied to annual bedding schemes and applied them to the use of hardy plants, establishing an approach to garden design that remains the basis of much modern work. 1890-1914 Miss Jekyll formed alliances with the garden writer William Robinson and the architect Edwin Lutyens, which resolved ideological struggles and set new standards for garden-making by thoughtful experiment and reasoned moderation. Her clients were typically drawn from her own background of prosperous gentlefolk. Her design ideas, divided between the neat geometry of her terraced parterres (reinforced with strong evergreens such as yuccas, right, and bergenias) and the sinuous lines of her woodland-edge shrubberies, were spelt out in informative but ponderous books in the years between 1899 and 1914. 1919-1932 After this late success, the changed nature of society after the horrors of the First World War and her own advancing years meant a quiet final chapter. Many of her gardens declined in the mid 20th century, but several modern restorations have ensured a renewed and lasting interest in her work, which has influenced successive designers from Karl Foerster (1874-1970) to Piet Oudolf in the present day. Miss Jekyll died in 1932 and was buried in Busbridge churchyard, Surrey. Her monument, by Lutyens, records her as ‘Artist, Gardener, Craftswoman’. Her obituary in The Times recorded that she did not cease ‘to share widely the fruits of her long and loving apprenticeship to Nature’.